I And My Father Are One – How? When Jesus states, “I and my Father are one…” in John 10:30 we must determine, is he literally stating that he and his Father are one and the same God, or is he saying they are unified in purpose and mind? Historically, many of our early American church forefathers, those who helped establish churches most commonly known as “Oneness” (Apostolic) churches, all used this scripture (John 10:30) in an attempt to support the understanding and teaching, at that time, that Jesus was God. 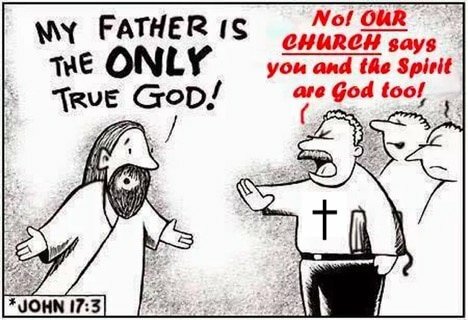 A problem, however, immediately arises; How do we explain God as being his own Son and Jesus as being his own Father if, as they claim, the Son and the Father were literally one and the same God. Today, we have more information available to us than they had and are more knowledgeable in the translation/transliteration of these early writings. Depending on the Scripture, “one” often means unity. Jesus was “one” with the Father not because Jesus was God himself but because he had the Spirit of God (the Father) dwelling in him; “I speak not of myself: but the father that dwelleth in me, he doeth the works” (John 14:10, 2 Corinthians 5:19). The correct understanding is Jesus and “his Father” were united (by Gods’ Spirit) having one purpose (which was to save fallen mankind), and were in one accord. This was possible because of Jesus’ perfectly submitted will; Jesus surrendered his human will to the will of his Father (God). This scripture bears witness that Jesus struggled with his human will. He did not want to die but submitted his will to the will of the Father so that they could be and remain one in purpose. It also bears witness to the fact that Jesus and his Father had two separate wills, “…nevertheless not my will, but thine, be done.” So being literally one seems to be ruled out. This verse is spoken in the same context as several other verses that speak of others as being one (united). More than one (Plural) person is always equal to “more than one” person they could, however, be “One” as a group, a group who have something in common (i.e., united in purpose) and the bibles use it that way in several verses. Jesus then asks his Father, not himself, to keep the church and to allow them to be one, as they were one. When we become one with God, it is quite obvious we do not become God. There are numerous examples of scriptures that talk about being of one mind and in one accord. Unity yields results. (Acts 2:1) “And when the day of Pentecost was fully come, they were all with one accord in one place.” Clearly, the church body was unified, and when we become unified (especially as a church body of Christ) things happen. This particular passage leads us to that momentous experience when the Holy Ghost fell on them (Acts 2:4). Here again is an example of a unified church causing things to happen; a people being in one mind and one accord with the will of God. When the epistle was penned to the church in Philippe they were reminded that unity was vital to spiritual success.